Lake Trasimeno is entirely within the Italian region of Umbria but, in places, the Tuscan border runs very close to the northern and western shores. 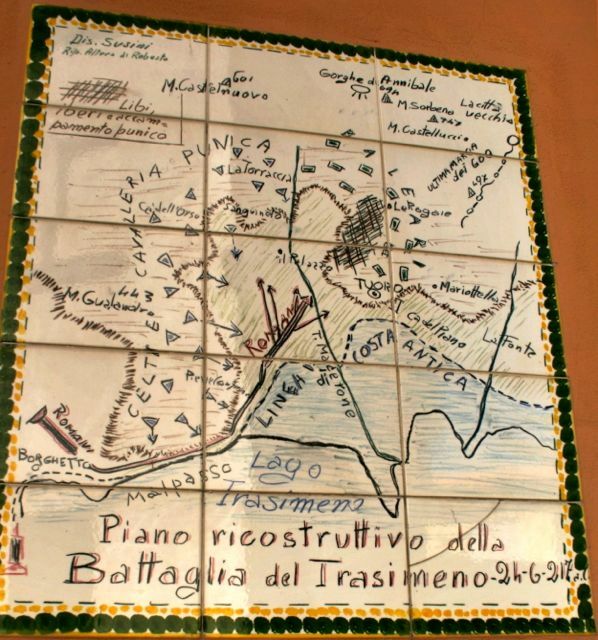 There was intense fighting in World War II near the Lake as allied forces pushed the Germans back from what was known as the Trasimeno Line. However, when people talk about the Battle of Lake Trasimeno they are referring to fighting which took place 2200 years ago and had a higher death toll. The Battle of Lake Trasimeno took place on the northern shore of the Lake in 217 BC. It was one of the bloodiest battles (and worst defeats for the Romans) of the second Punic War. The Punic Wars were fought between the Mediterranean super- powers of Rome and Carthage (a city on the coast of what is now Tunisia); they ultimately led to the destruction of Carthage and the dominance of Rome. Carthage was a city founded by the Phoenicians, a people who traded widely around the Mediterranean and who originated from the Middle East. The Carthaginian general at Lake Trasimeno was Hannibal. 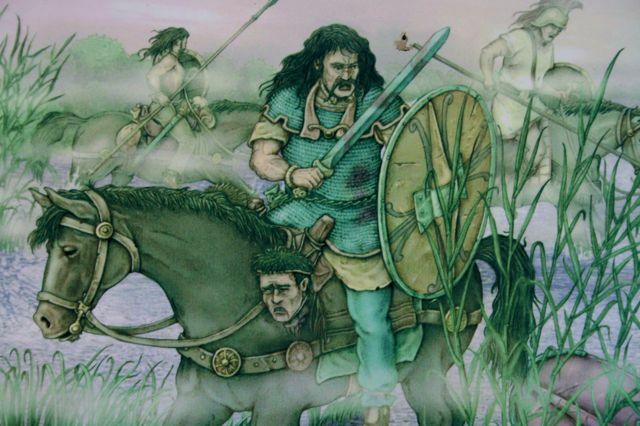 The unorthodox military tactics used by Hannibal led to a series of defeats for the Romans; he came very close to halting the rise of their empire. The capture of Rome seemed a likely prospect after Trasimeno; if the non-Roman tribes had joined him in his campaign it could easily have happened. Memories of Hannibal’s campaign were still fresh in the minds of the Romans six decades later when the Senate voted to completely destroy Carthage in what would become known as the 3rd Punic War. After crossing the Alps, and having won a resounding victory at Trebbia (near Piacenza), Hannibal’s army was marching towards Rome. Hannibal was deliberately laying waste to the countryside and towns that he captured. This tactic was intended to provoke the Romans into a hasty, ill-considered attack. The Roman Commander, Caius Flaminius (Caio Flaminio), was advancing south down the Val di Chiana from Arezzo. He thought he was well behind the enemy army and was probably hoping to meet up with reinforcements south of Perugia before facing Hannibal in battle. Hannibal had in fact deployed his army in the hills above Sanguineto, just to the north west of Tuoro. From here he could watch and surprise the advancing Roman army. At dawn of 24 June 217 BC, the Romans were advancing into the ambush. During the night, some of Hannibal’s men had lit fires on the hill near Castel Rigone to give the impression that they were still half a day’s march away. To the right of the marching Romans was the swampy shore of the Lake. The water level was higher than today, roughly equivalent to the route of the road between Tuoro and Terontola. To their left were the slopes hiding Hannibal’s army. This carefully chosen topography meant that once the Roman army had entered the narrow gap between the Lake and hills (now called Malpasso), there was no escape. To make matters worse, fog blanketed the lake and lower ground, further obscuring the Carthiginians’ presence from the Romans. Without warning, Hannibal attacked the marching Roman columns. They did not have time to organise into battle formation and, for the Romans; it rapidly became a case of every man for himself. 15,000 Romans were killed for the loss of 1,500 men in Hannibal’s army. It seems likely that several place names in the area have origins resulting from the Battle. Sanguineto, (the place of blood), Ossaia (the place of bones), Sepoltaglia, (the place of tombs), Malpasso (bad pass) and Pian di Marte (Plain of Mars, the Roman God of War). Others claim that Marte is a corruption of martire, Italian for martyr, and refers to the Roman prisoners who were executed there. For the next two years, the Romans avoided meeting Hannibal in open battle. 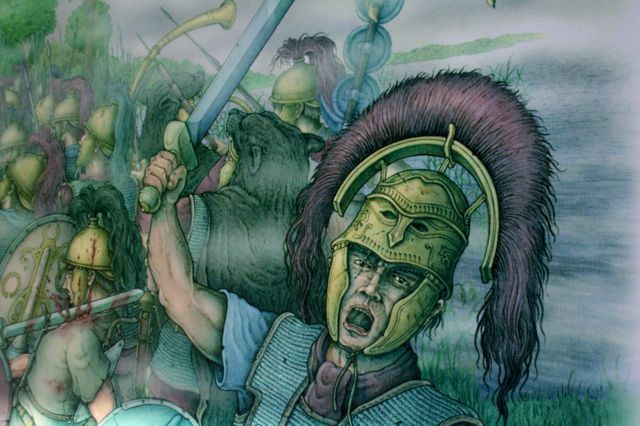 When they tried again at Cannae in southern Italy (215 BC), they lost 70,000 men out of an army of 80,000 deployed against a force of around 45,000 on Hannibal’s side. In a battle still studied by military tacticians, Hannibal deployed his heavy Gaulish infantry in a thin convex curve. As the Roman infantry attacked, the curve gradually fell back into a concave shape. Hannibal had held his elite African troops in reserve and they now attacked the Roman flanks. The Romans found themselves surrounded on three sides and unable to use their greater numbers to their advantage. Meanwhile, the superior Carthaginian cavalry chased the Roman cavalry from the battlefield and then attacked the infantry from behind. Once again, Hannibal failed to take Rome after the battle and gradually the Romans learned to copy his tactics. He was defeated in Africa 13 years later (202 BC) by the Roman general Scipio Africanus, who had been one of the few to escape from Cannae. Instead of fulfilling his dream of destroying Rome, Hannibal had inadvertenly taught them the military tactics that helped them to create their empire. You can follow a Battle of Lake Trasimeno walk in my book Circular Walks on the Tuscany Umbria border. 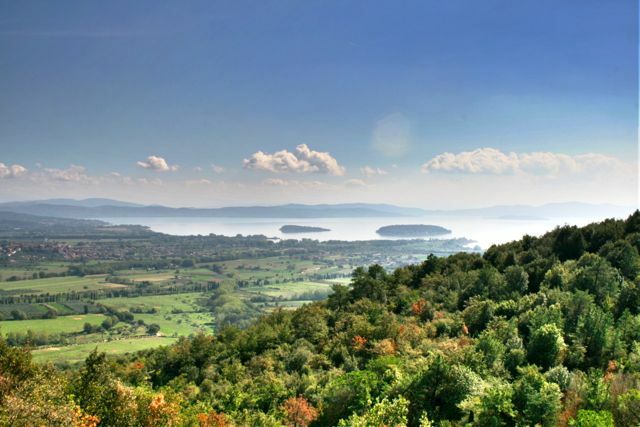 The walk starts and ends in Tuoro sul Trasimeno and takes you on paths high above the battle ground before crossing the flat ground where the majority of the fighting took place.